We're working with Tropicana Hotel in Atlantic City, New Jersey in order to get a lower rate for you and your students! In order to book the hotel rooms, please use this link in order to get the discount. The 2018-2019 season of CSL reaches its finale with the top 3 teams for CS:GO, Dota 2, League of Legends, and the top 16 teams for Fortnite going up to claim the title of grand champion! 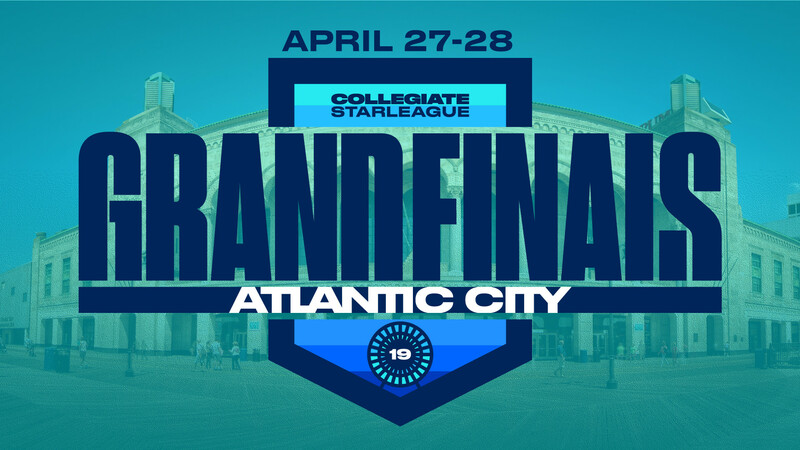 Played and casted live at Grand Finals, cheer on your favorite teams in person in Atlantic City or at home on our Twitch streams (https://twitch.tv/cstarleague and https://twitch.tv/cstarleague2). On top of our league grand finals, additional tournaments will be held at the venue over the two days. We’ll be hosting seminars, aimed at helping YOU tackle the challenges that come with organizing collegiate esports! We’ll be inviting special guests and hosting an esports industry focused job fair. Stay on the lookout for additional announcements for guests, talents, and companies! All open tournaments are open to students of ANY grade level and are free to enter - you only need a general event ticket for entry. Read on for more information on tournament details, including how to register for each specific game tournament. There will be two separate tournaments on Saturday and Sunday; form your teams of (3) to prepare to compete for your share of a $5,000 total prize pool! The Apex tournaments are open to students of ANY grade level with a student ID card required for check in; players on the same team do NOT need to be from the same school or grade level. There is a maximum of 32 team slots available, with 24 online pre-registration slots available and 8 available at the door/for backup pre-registration. To pre-register for one of the 24 slots, email [email protected] with your team’s information; priority will be given pre-registration time. Teams may pre-register for Saturday-only, Sunday-only, or both days; teams that pre-register for both days but no-show on one will be deprioritized. The tournaments will take place on PC. We will be using a point system format, with teams with the highest points in a single game advancing for each round (tiebreaker = report time). Teams may play as many games as they can within each 1 hour round window, however only the single highest score for a team will be tracked for leaderboard/final standing purposes. We will be running a Super Smash Bros. Ultimate 1v1/singles tournament open to all high school and college students on Saturday, April 27. There will be a $5,000 pot bonus on top of the entry fees collected from competitors. Bracket will cap at 512 entrants. Free play on 32 Nintendo Switch setups will be available all day on Sunday. We’ll be running both 1v1 and collegiate 3v3 brackets in conjunction with Capcom for Street Fighter V: Arcade Edition! Each event has a $1,000 pot bonus. Team up with students from your school or fly solo for a shot at the gold! Additional info can be found on our Smash.gg registration page. Fill out our application or send an email to [email protected] with the title 'CSL AC Volunteering' to let us know!